Mary Emery’s vision for the new town of Mariemont was for everything to be of the highest quality. This thinking extended to the selection of John Nolen of Cambridge, Massachusetts as town planner. 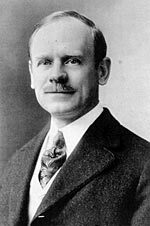 When Charles Livingood, Mary Emery’s business manager, first approached him in 1920, Mr. Nolen was firmly established as the top town planner in the United States. His credentials included many successful projects, including improvements to Cohasset, Massachusetts in 1916, the lovely Union Park Gardens near Wilmington, Delaware in 1918, and the planned community of Kingsport, Tennessee in 1919. John Nolen received his bachelor’s degree from the University of Pennsylvania in 1893, and went on to earn a master’s degree in the relatively new field of landscape architecture from Harvard University in 1905. Nolen kept busy with his planning projects, as well as a full slate of lectures and essays promoting the principles of solid planning for new towns, existing towns, and parks and green spaces. Nolen was involved in the creation of Mariemont for five years, from 1920-1925. The intention was to develop Mariemont as an example for more towns like it to be developed across the country. However, neither Mr. Nolen’s original blueprint, nor the idea of a “national exemplar” was fully realized. Mary Emery’s death in 1927 and the subsequent economic upheaval of the Depression prevented some of the plans from coming to fruition. A great deal was accomplished, however. John Nolen had Wooster Pike straightened so that it ran through the center of the new village, rather than ducking down towards the Little Miami, as it did prior to construction. His street and landscape plans were followed to the letter, resulting in the lovely village we enjoy today. Running phone and electric wires underground was part of the original, and Mr. Nolen played a key role in the selection of the top-flight architects who were selected to create the look of the town. For further reading: John Nolen and Mariemont, by Millard F. Rogers, Jr.